In August 2014, "Hurricane Bertha" - the latest of several femmes fatales of that name - caused extensive damage and some loss of life by winds and floods across the United Kingdom, and elsewhere, e.g. the east coast of the United States and in north-western Europe. On 10-11 August, several roads and rail lines were cut in Aberdeenshire and Moray by serious flooding, particularly from the Dee and the Moray rivers, in what has been described as a 1-in-200 year event. In the Cairngorms, torrential rain brought severe flooding to the Mar Lodge Estate. The Dee and most of its tributaries burst their banks, and bore downstream many trees and other timber. 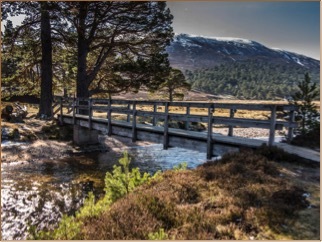 The footbridge over the River Derry at Derry Lodge was washed off its piers, cutting the main route to the Lairig Ghru, and obstructing access to or from Derry Cairngorm, Ben Macdhui and the Lairig Laoigh. The footbridge a mile or so up from the Quoich Punchbowl, on a popular circular walking route, was also lost, and about 100 yards of the vehicle track a little further up that glen was completely washed out. Elsewhere on the estate, the floods caused damage to footpaths, fencing, vehicle tracks and road bridges (e.g. over the Quoich), and even to the flood defences for Mar Lodge itself. Fortunately, none of the buildings on the estate were affected, although the main drive into Mar Lodge was impassable for several hours, and the Quoich outlet to the Dee was significantly altered. And the bridge at the Linn o'Dee remained standing, although roaring waters completely filled the Linn itself, and washed away the memorial which stood a few yards to the east of the bridge. The footbridges at the Derry Dam and at Corrour were unaffected. To the north, the rain caused damage in Coire an t-Sneachda, where slabs from the cliffs above the Goat Track were dislodged, and fell onto and around the track. A climbing fatality in the same corrie three weeks later was blamed on rocks being loosened by the weather. On Speyside and on the Glenlivet Estate, several paths were closed or damaged for a while. 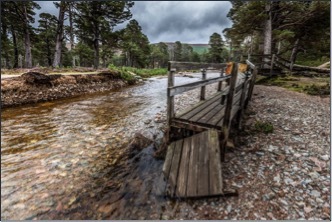 At time of writing (March 2015), the Goat Track has been made safe, but the Mar Lodge bridges (both on National Trust for Scotland land) have yet to be re-established, and much other flood damage remains to be repaired, at a cost estimated by the NTS at some £800,000, including about £172,000 for footpaths and another £60,000 for helicopter supplies. NTS have issued an appeal to help raise these massive sums, and is considering a temporary bridge replacement at Derry Lodge. In memory of its past Chairman and President Donald Bennet, ScotWays (the Scottish Rights of Way Society) is to launch an appeal which may be used to assist a bridge fund, and the Cairngorm Club is also considering a significant contribution. Meanwhile, at Derry Lodge, a helpful tree has been used to cross the water but cannot be relied on for long.